I think, from my rough calculations, I was there from '59 to '65 (I remember leaving in '65). I have mixed memories of Barnsbury - most good but was subject to a bit of bullying in the 'Upper School' - I will tell you more of that story later. Like most of us, I had a couple of years at Eden Grove, and as I lived in Thornhill Road I walked down past the back of Pentonville Prison to get to school, and also passed the Barnsbury Girls in their green uniform going the other way. When we moved out of our 'slum' and got a council house which was in Holloway, I was able to walk to the Camden Road school. I remember getting the trolley buses round Highbury roundabout & the poles falling off. I was in Green House, but I don't remember (or have not got) any school photos. I will have a think and put together a few of my memories of my schooldays at Barnsbury. I became a Motor Mechanic for the GPO (as did my Dad and Granddad ) when I left school. My best subjects were metal work and woodwork - I left with 1 'O'Level in Technical Drawing. Later I went on to be a Senior Lecturer At Hackney College in Motor Vehicles!!! Barry, it looks like you were a couple of years ahead of me! My younger brother went to Highbury Grammar School as he passed his 11 +. Glad to join the Barnsbury Group. Having just found this website, which brought back some school memories, I thought I'd reminisce about what memories I have, if I may. I have attached 2 photos - see bottom of the page. I was at Barnsbury School for Boys from approx. 1952 to 1958 (I stayed on for an extra year). The subjects I enjoyed were: English, French, Mathematics, General Science, Physics and Art, for all of which I gained an ‘O’ level; sufficient to begin a degree course in Architecture at the North London Polytechnic in Holloway Road. I stayed on at school for an extra year because I failed the English 'O' level exam, even though I was top in my class! At the end of that extra year I finally passed 'O' level English. I was generally quite athletic and enjoyed football (had a trial to join the Islington football team as goalie - however I let in too many goals on the day!) along with Ted Pitt-Jones. Also played cricket and took part in field athletic events. The teachers I principally remember are - Bill Matthews (Mathematics), Mr. Meyer (French), Mr. Freeman (Geography), Mr. Hinchcliffe (English), Mr. Richards (P.E.) and Mr. Davies - 'The Bonk' - Headmaster (French and Mathematics). I also enjoyed Art, but can't remember the Art teacher's name. I liked Bill Matthews. Tall, thin and Welsh I think, who always wore a brown tweed suit with waistcoat, plus pocket watch & chain. Never varied from that outfit as far as I can remember. I forgive Bill for lifting me up out of my seat one day by the sideburns. Those were the days when corporal punishment of one kind or another was tolerated. However, he enthused not only me about mathematics, but about 40 or so more boys (a very full and busy classroom), who voluntarily stayed on for an extra hour after school to enjoy 'Fun Mathematics'. This lasted for about a year, possibly longer. After each session, I with a few mates, would go to the local Greek Cypriot café in Holloway Road for a cream coffee and a Rum Baba! He was our form master for a year or more, and he, too, I liked. He enthused me about the French language. During one year of French, he christened each of us with the nearest French equivalent of our names. My name is Bruce, for which there is no French equivalent; so I was christened 'Bruno'! Others were 'Pierre' for Peter, 'Jean' for John, and so on. I remember that he, too, used corporal punishment from time to time - the slipper! Didn't much like Geography so don't remember very much about Mr. Freeman except that he had a glass eye, which he would take out now and again and polish to amuse us boys! Poor Mr. Hinchcliffe! From Yorkshire I think. He was bullied by boys' behaviour and consequently shouted at us nearly all of the time, but he coped well and was generally well liked! He used the slipper quite a lot though, but never on me! I remember an embarrassment when he decided to read out loud a composition - a piece of homework I had written - to the whole class. He liked my composition and years later I found I was very much interested in the English language/literature. 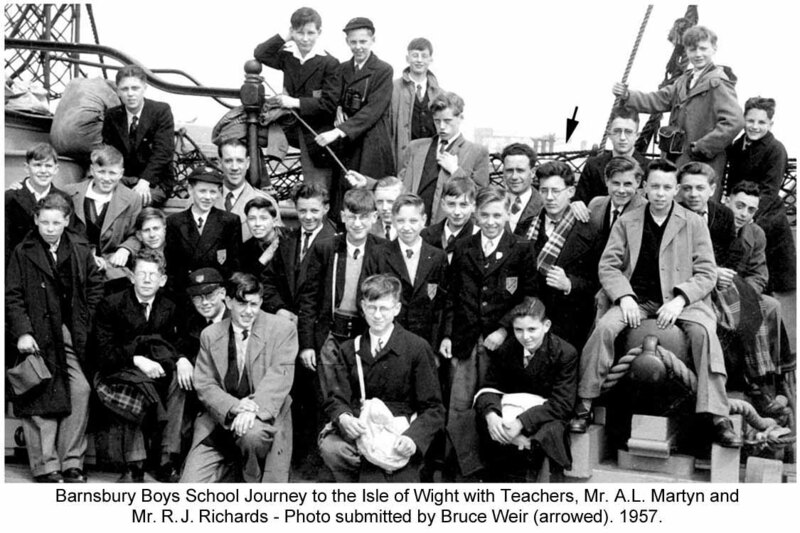 Don't remember very much about Mr. Richards, except that he was one of 2 teachers who accompanied about 30 of us on a 2-week school holiday on the Isle of Wight. See photo attached. On this school holiday I remember an incident - for me it was an incident - while walking back from Sunday church to the hotel where we were staying. Not a good memory. I didn't realize it then, but did so years later when I understood what religious prejudice was all about. A group of us boys were walking back from church when Michael joined us from nowhere. One boy asked, "Where have you been Michael?" Michael didn't reply. The same boy then said, "We've been to church Michael, where were you?" Michael said, "I don't go to church". Then the boy said, "You've been to a synagogue haven't you Michael? You're Jewish aren't you? Go on, admit it!" All of this in an accusatory tone. Michael replied, "No I'm not", despite the fact that he was clearly Jewish, but felt he had to deny it. I didn't know what religious prejudice was in those days, being too young to understand these things then. I can only assume that the boy who asked these questions was echoing his parents' prejudice. Nothing more was said after that and we carried on enjoying our holiday on the Isle of Wight - coloured sands I remember. Mr. Davies - 'The Bonk' - Headmaster (French and Mathematics). I was caned by the Headmaster, for why I don't remember. I do remember that I got 6-of-the-best across the palm of my hand. Painful! Might have been both hands but don't remember. He also took our class for French lessons - presumably Mr. Meyer was unavailable at that time. He had us keep a notebook handy at all times to write down anything French that came to mind at any time so that we had a sort of running commentary of current French words or sayings and what they meant in English. He also taught me the basic rudiments of calculus during my extra year at school, but this was a subject I couldn't wrap my mind around at all! My best mate at school. One day at the end of playtime we were going back in through the main entrance when a 5th form bully tried something on with Bert. There was a considerable difference in size and height between the two of them. He was older and very much bigger. Suddenly Bert jumped up into the air, stretched out and punched him squarely on the nose, and then ran for his life! The bully just stood there with his hand on his nose and stared after Bert. (This bully was later expelled from school). Bert told me that his Dad had told him to stand up for himself, but then to run if the odds were against him. My Dad was an ardent cyclist and had a push bike that he lent me for weekend use. Peter asked one time if he could borrow the bike, and Peter was quite big and heavy. Later he came back with the bike and apologized. The frame of the bike had broken - rust! Don't think my Dad minded too much. Saved him and me from having a serious accident later on. Peter was unhurt! Omo was the only black boy in my time at school. Omo was the commercial name for a whiter-than-white detergent! He was treated very well and was looked on with affection I think. Other mates that I remember - Michael Haffner, Terry(?) Pritchard, Ted Pitt-Jones, Chas. Hovell, Vincenzo Sartori, Roy Bird and others. Well, that's all I can remember for now. Maybe more later on. Before moving from Vittoria Primary School to Barnsbury Central I had passed my 11+ and had won a place to a Grammar School. However all Grammar School places were full at that time and I was told that after one year at Barnsbury I would be transferred to a Grammar School. I remember being asked a year later if I wanted to transfer but I was very happy at Barnsbury, having made mates there, so declined! Wonder where I'd be now if I had opted for a Grammar School! My School Reports said quite a few times 'could do better if he tried' even though I was always in the top 5 places in class. Maybe I'd be rich if I had changed places back then. Too late now! When the Youth Employment officer came round, interviewing those of us close to leaving school, I was asked what I wanted to do. I said either civil engineering or veterinary medicine. He pondered for a moment and said "why not consider being a bank clerk?". Glad I didn't take heed of what he said. Studied architecture and ended up eventually being a group leader in the Architectural Department in Islington Borough Council. This was an event which could easily have led to a death of a young lady. Thankfully I interceded and a possible tragic accident was averted. It also had, I hope, a happy ending. But here’s the twist – I never saw the woman again, so I do not know what happened next. During the 1970s, I worked in Islington Borough Council’s Architect’s Department in Margery Street. The street, located between Amwell Street and Farringdon Road, was a one-way, downhill rat-run. Cars drove fast past the large plate glass windows of our entrance area which looked directly onto the street. In the middle of the road was a young woman deliberately trying to jump in front of every swerving car that came racing by. I automatically reacted and immediately dashed out onto the pavement. Looking briefly to my right, I walked out and stood facing her in the middle of the road with my back to the traffic. I remember asking her what she was doing? And why? Then something in the back of my mind hinted subconsciously that this was not your typical English behaviour, so I said, “Do you speak English?” She answered yes and that she was German. She [quickly] calmed down then so I pointed to a low tiled wall, part of the landscaping outside the Architect’s Department, and suggested we sit down there to talk. She spoke English very well with a soft German accent. She was about 20 years old, I’d guess, extremely attractive, intelligent, well groomed, clean and fresh looking, wearing a bright summer dress. She told me she wanted to kill herself. She said that her boyfriend was to meet here, outside the Finsbury Town Hall, and he hadn’t turned up. She’d been dumped. With relief I was able to tell her that she was not outside Finsbury Town Hall, but that she was outside the Islington Architect’s Department in Margery Street, and her boyfriend was most likely waiting for her outside the Town Hall which, as we all know, was in Rosebery Avenue, just around the corner. I walked her up to the end of our building and pointed to Rosebery Avenue where she could see cars and buses passing by, and where she’d find Finsbury Town Hall and, hopefully, her boyfriend. We exchanged kisses continental style and off she went. I am certain that they were meeting outside there to get married, so I hope she found him, got married and lived happily ever after! Have my doubts, though. So temperamental, such passion! On my way to Barnsbury School one morning, I made a big mistake. I was late, and because I didn’t like being late for school I was in a hurry. And that hastening might nearly have led to a fatality. Mine. It was 1953-ish and I was 12 years old when this happened, and although I was a good boy who looked left and right before crossing roads, I did not do so on that day – not properly. I walked quickly and anxiously along Wynford Road, where I lived, towards Caledonian Road at the bottom of my road, to catch my bus, and as I approached the junction I glanced to my right a few yards before reaching the zebra crossing by All Saints Church. Looking that way, Caledonian Road rises towards a hump back bridge and then disappears around a tight bend. That short stretch of road was empty. I then looked to my left and saw my bus approaching on the opposite side of the road. It was slowing down towards the bus stop, but I knew I’d have to run to catch it. I was still a couple of paces short of the zebra crossing, but my attention was focused on the bus. I stepped off the kerb onto the black and white stripes of the crossing and then reached - oblivion! The next thing I remember was lying stretched out looking up at bright lights. I raised my hand and felt a large bump/swelling on my forehead. Then a nurse grabbed my hand and told me to keep still. I was in the Royal Free Hospital being X-rayed. I was OK but for a headache and a developing black eye, but was kept in a secluded room under observation for 24 hours. I later learned that an electric trolleybus had knocked me down as I stepped onto the crossing. In just a few moments that trolley-bus had come around and over the hump back bridge and rolled silently and quickly towards the zebra crossing. I obviously hadn’t heard it coming. I also learned that I sat on the kerb with my head in my hands after being knocked down, and that a police car had taken me to hospital. I don’t remember more than I’ve set out here, even of my parents visiting or taking me back home from hospital, or even of a doctor examining me. But I do remember one thing with great clarity. Funny how certain memories get permanently etched on one’s mind. I had been in hospital for 24 hours and had not had a single pee in all that time. On the morning I was due to leave I woke up needing a very urgent pee. I was in a strange place, bursting and getting frantic, but I couldn’t find the bell push for a nurse. Then I found a pee pot under the bed, a BIG, round china one. With great relief I started peeing. I pee’d and I pee’d and I pee’d. Now I was getting anxious as the pot filled up - it just kept filling and filling and filling! I stopped peeing just millimetres short of a very wide china brim. A close thing! When a nurse eventually came to see how I was, she had to tiptoe very slowly away, balancing a very heavy pee pot carefully in front of her, trying as best she could not to spill a drop. Another memory took place about 30 years ago. Caledonian Road was absolutely crammed chock-a-block with traffic at a standstill. I was on my BMW motorbike coming from beyond the viaduct towards the traffic lights, and because the traffic was not moving I overtook the whole line of traffic at a dawdling pace, but just on the wrong side of the white line. As I got nearer to the traffic lights, a policeman suddenly came charging out from nowhere and stopped me. He was fuming and in a right state. Anger and frustration pictured all over his face - not because of me, but because of the traffic mayhem. I, presumably, was the last straw. I cut the ignition, steadied the bike, unbuttoned my helmet and took it off. His attitude changed immediately when he realised he was looking at a man in his late 40s, and not a teenager. I was about his age. We had a little chat and his anxiety and frustration slipped away a little. He was on his own and maybe our chat was enough to calm him down. A familiar view here (photo courtesy of Bruce Weir). I remember in the 1950s, when I was about 12 or 13, riding on my pushbike near the Cally Tube Station when I found that I couldn't go any further. The road was absolutely filled - jam packed - pavement to pavement - with countless cattle! A veritable sea of brown. Never have I seen so many cows, and especially along a London road. They were being herded over the viaduct, probably from the railway tracks below, and sadly going off to the Caledonian slaughter house. I seem to remember that there was always a 'smell' around that area whenever I passed that way! The market was built by the City of London Corporation to alleviate the environmental problems and overcrowding of livestock at the original open air Smithfield market. I was born on the 5th of May, 1945, at the Royal Northern Hospital, Holloway Road, and until 1963 lived with my parents and younger sister at No. 1 Crane Grove just off Holloway Road near Highbury Corner. I attended Laycock Infants and Junior Mixed Schools and later, of course, Barnsbury Central School for Boys, as it was known then. My father was a joiner and cabinet maker, and during the war was engaged, along with other building tradesmen, to repair bomb damaged infrastructure. For example, police stations, hospitals and other essential buildings, to get them up and running again as soon as possible. My four uncles served in the Army and Royal Air Force in North Africa, Europe and the Far East. All survived the war, three of them staying with my parents at Crane Grove for a couple of years after demobilisation. The house, which had a semi basement and three upper floors, was an end of terrace and was leased in my mother’s name after her father had died in 1938. There was a brick air raid shelter with a thick concrete roof in the back yard that served the families of the houses up to Digswell Street. Complete with gas masks and tin hats, it had an amazingly flimsy door, and a pick and shovel for digging yourself out should the house collapse on the shelter; assuming you survived, that is. The small back yard was all that remained of a previously more extensive garden that had had a factory (Grant & West) built on it. I never did find out exactly what it was that they made, but the guy that owned it was an amiable Frenchman who drove a 1948 Riley Roadster. I remember on one occasion he presented us local kids with a box of about twenty reasonably good quality brass telescopes. I have no idea what eventually happened to the two I managed to acquire. The Grant & West factory roof was a mildly challenging climb. One could easily get onto the first level from the steps beside the house and then onto the second level by climbing the fire escape that terminated on the lower roof. Climbing on the fire escape handrail and heaving yourself up gave access to the second level. From this second level there was a drainpipe and a more difficult climb that gave you access to the main factory roof. It was necessary to get to the top as I often lost my arrows up there. Looking back, I had a happy childhood, free to wander the streets, parks and rubble strewn bomb sites where me and my friends had many adventures. Wandering up Orleston Mews would usually result in being told to clear off by someone working in the factory that was there at that time. As would scaling the gate to the coal yard that ran between Liverpool Road and Holloway Road. Riding scooters and soapbox carts, scaling trees most usually in other peoples gardens. If we were caught we would be cautioned by the local Bobby, who would threaten to drag us by the ear to confront our parents, who he seemed to hope would be suitably outraged by our misdemeanours. I think my parents were fairly progressive, if that is the word, inasmuch that I don’t ever remember being subjected to any form of physical punishment. It was simply expected that I would behave responsibly, a state that I must confess I frequently failed to achieve. When my uncles moved away, the second and third floor flats were redecorated and let, which provided a bit more income for the family. The third floor flat was rented by a Mrs. King, an elderly widow, and the second floor flat to Mr. and Mrs. Saunders. Mr. Saunders was a private detective, which I thought was an interesting turn up for the books and a fascinating profession, having seen many examples of the trade portrayed at the Saturday morning matinées. I imagined him stalking dastardly villains, snub nosed revolver in hand. Even though he did not quite fit the bill, being quite elderly, compared to his screen counterparts. Then my mother shattered my illusions and informed me about the rather less glamorous reality of the job, spying on errant wives and husbands. Some of the things I remember about my life at the time are the journeys with my mother to Chapel Street market to get the weekly shopping, sometimes by bus, but more often than not we walked as we could not afford the bus fare as things were tight in the immediate post war years. This was a weary trip for me at that age, and more so for my mother with shopping bags full of spuds and cabbages. There were also trips to Drayton Park to get ration coupons, as at that time in the UK rationing was still in force after the war. Fish and chips was an occasional takeaway treat usually from the chippy near the corner of Islington Park Street and Upper Street, or just past Drayton Park in Holloway, where I would be despatched bearing money and an order. Sundays were often taken up by trips with my father, occasionally accompanied by my sister. In the summer we would go to Hampstead Heath or sometimes catch the train from Waterloo to Box Hill and Ranmoor Common near where my father had spent his childhood. In the winter, it would be places like the Tower of London or the Science and Natural History Museums in South Kensington. I regret that I was never able to properly thank him for the time and effort he put into making my life so interesting and full of fun when I was a kid. However, I’m sure that he enjoyed those times too. One of the other things he did that I’m eternally grateful for was to let me accompany him to the adult section of the Central Library in Holloway Road and select books that I found interesting, which he borrowed on my behalf. I was, I suppose what would now be called a nerdy kid. 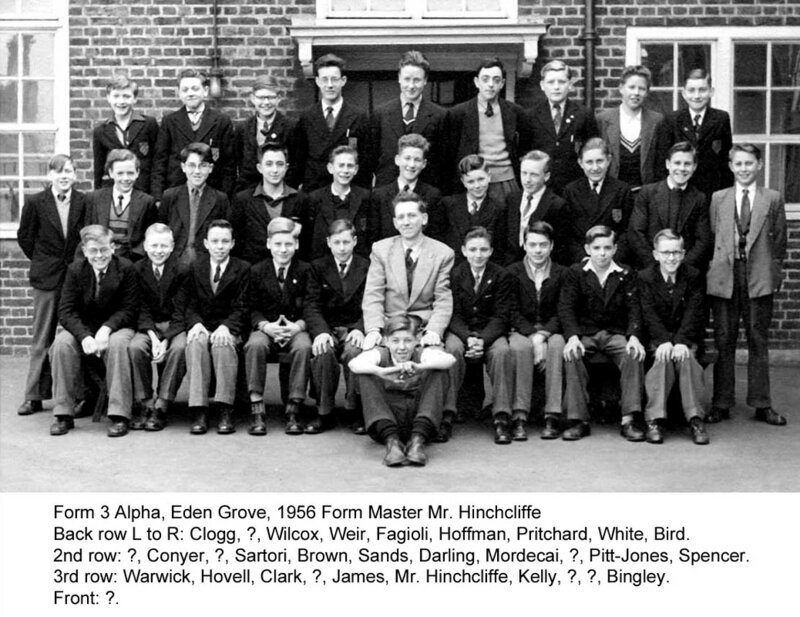 I was interested in geology, dinosaurs, space travel technology, and science generally, and had no interest at all in sports, which put me somewhat at odds with my school mates. However, I wasn’t the stereotypical weedy little nerd, and was quite prepared to stand up for myself. I can remember quite a few playground fights I had with other pupils, the boys in the class would rate you on the outcome (this was one of the criteria by which kids were judged in those days). it was not unusual to go home with scuffed elbows and a fat lip. My mother had been brainwashed by the Catholic Church when a child, so at one stage insisted that I attend Mass with her and my sister on Sundays. This I did as infrequently as possible for several years. Although I had to go sometimes as I did not want to offend her, but by the time I had become a pupil at Barnsbury I had wriggled out of it. I have been an atheist for as long as I can remember, and can still recall how surprised I was to discover that the infant school teachers, who read us stories from the Bible about the performance of miracles, Noah’s Ark and so forth actually believed that stuff. I am not merely an atheist but positively anti-religion to this day. My mother had been employed in the rag trade before and during the war, and decided to take up her old profession as a tambour beader. This involved sewing sequins onto evening gowns at home as an outworker. She often worked many hours into the night at her beading frame, supplementing the income that my father made as a cabinet maker. Having a bit of extra money enabled the family to go on an annual holiday for a couple of weeks a year, usually to the Isle of Wight, and on one occasion to Hayling Island, which I didn’t find nearly as interesting. 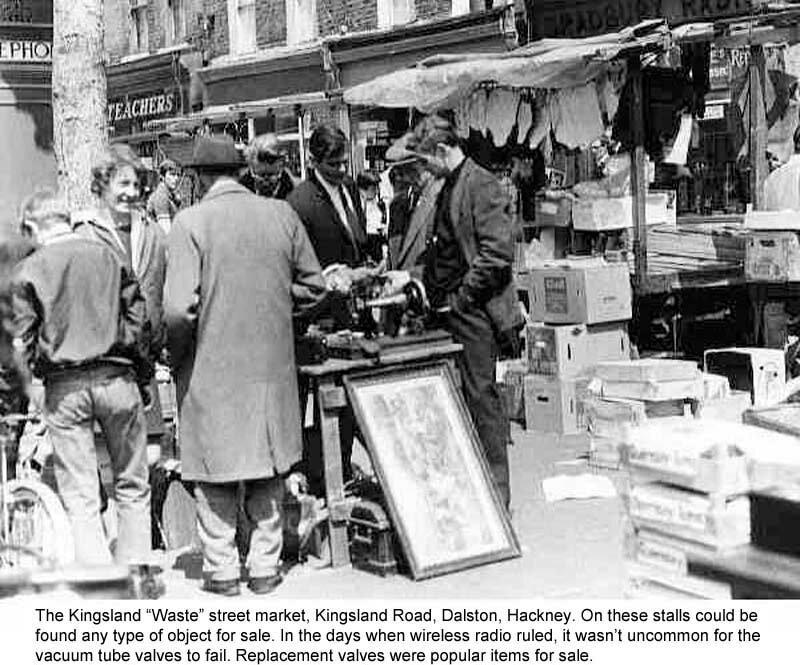 One of the places that I loved to go with my dad was the ‘Waste’ - the market in Kingsland Road, Dalston - where you could buy just about anything. I still have some of the tools that I purchased there as a child. 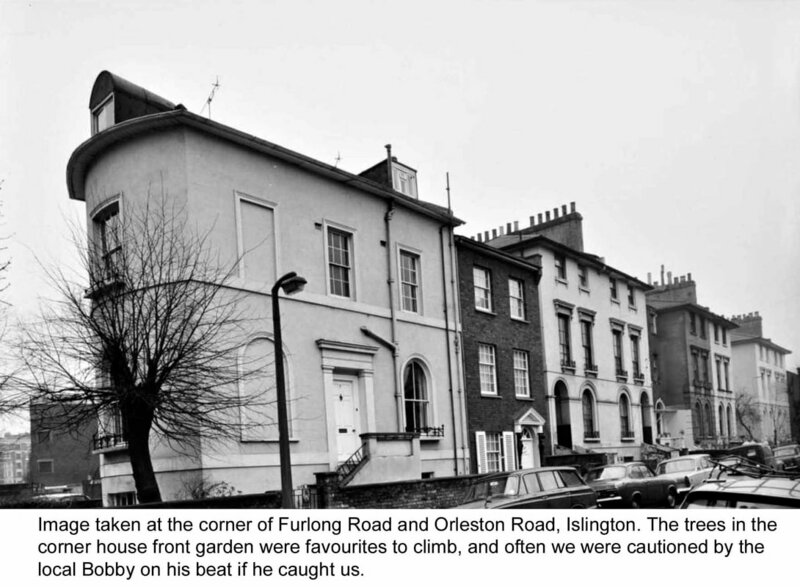 The firm where he worked was nearby in one of the streets or mews on the north side of Dalston Lane, and he would travel daily to work on the North London line from Highbury Station. At that time, the firm that employed him mostly made custom cabinet work, and interior fittings for the BBC. My primary schooldays were spent at Laycock Infants and later Laycock Junior Mixed School. Like a lot of kids back then, I got canings from both Mrs. Morgan and Mr. Cox, the respective head teachers of those establishments, but I think it was just the way the world was at the time. I’m sure corporal punishment was even more severe in my father’s time and earlier. Being caned, however, did impart to one a certain aura of bravado for a day or two afterwards. At the infant school, I discovered that I could already read pretty well as my mother had, to a limited degree, taught me to read, and how to sound out words that I was unfamiliar with phonetically. I don’t remember spending much time on the subject however so she must have done a pretty good job. One outcome of this was that I was bored to death as the class went endlessly over “The cat sat on the mat”, etc. Though I can’t really say that my academic performance stood out in any way at that time, or at any time after. Playground games usually consisted of ‘He’ - more universally known as Tag - where you had one kid who would have to pursue a group of others then having touched one of the pursued they would become ‘He’, and so on. Or there was a more exiting version known as ‘Heball’, where the person selected would have to throw a ball and hit one of the other players, but in this version the person hit would join the initial thrower and so the pursuit would continue passing and aiming the ball until the last man standing was the winner. Some of the girls brought skipping ropes to school, and skipping was very popular among them; as was hopscotch, which was marked out in chalk on the playground. Dinky Toy model racing cars also went through a phase of popularity. The object was to see how far they could be propelled across the playground; the winner being the one that achieved the longest range. I seem to remember that paper aeroplanes also had a period of enthusiasm. Games like cricket had a following, but only seemed to work if drastically modified to suit the varying number of participants, and the short length of playtime breaks. The wicket had to be chalked onto a wall. The odd fight would occasionally break out, and was always a source of entertainment and distraction until the intervention of a supervising teacher, that is. This usually resulted in a visit to the headmaster and a caning for the participants. So, any serious disagreement therefore tended to be sorted out in the street after school. Conkers were always popular when in season and would often be collected on Sunday trips with my dad. Fitzroy Park at Highgate was the best place for this, as it was a route we often took from Hampstead Heath to my grandmother’s house in Bishops Road opposite Highgate Woods. 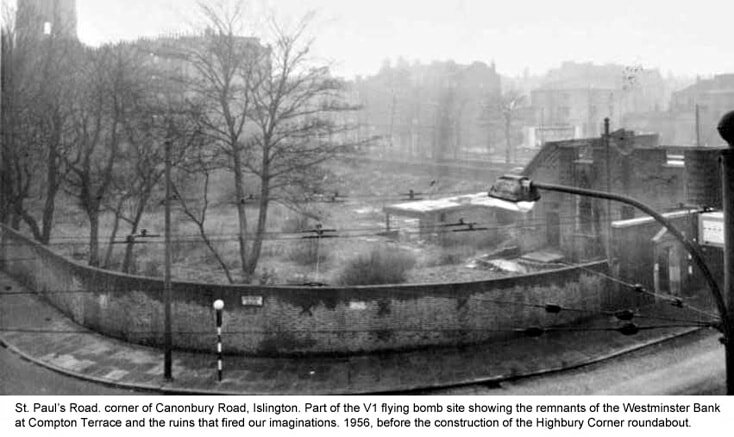 Every kid back then would have played on bomb sites, and there were many in Islington. The area of MacKenzie Road had been flattened and was now covered in prefabs, but many more opportunities remained around the area where I lived and I think I explored all of them. We would often engage in a game we called ‘stone raids’, where two teams would find defensible positions in the wreckage of a bomb site and hurl pieces of rubble and rocks at one another. I can remember getting a bloody cut on the forehead as a result of of a well aimed rock. I particularly remember scaling the wall that surrounded the old V1 site at Highbury Corner with the beautiful and tomboyish Pamela Gowing in tow who lived a few doors further up Crane Grove. We descended down a rubble slope to the vaults that remained under the old Westminster Bank. In the gloom of a subterranean corridor were double doors with still intact circular glass windows, but she would go no further thinking the place was haunted. Pamela was keen on “Famous Five” adventures and similar stories, and loved that kind of place, imagining it to be full of ghosts. One small bomb site was a particular challenge, it was opposite Compton Terrace narrow and walled off at either end, I climbed over the wall and had to drop quite a few feet down into where the cellar had been. When it came to getting out, however, I found too many obstructions in the way to enable me to get a sufficient run at the wall to scale it. I had to climb one of the large wooden props that held up the buildings on either side, and edge my way along the wall that had originally formed the building’s cellar, and then climb back over the wall into Upper Street. On one occasion, Pamela Gowing and I caught the 611 trolleybus up to Highgate Cemetery. 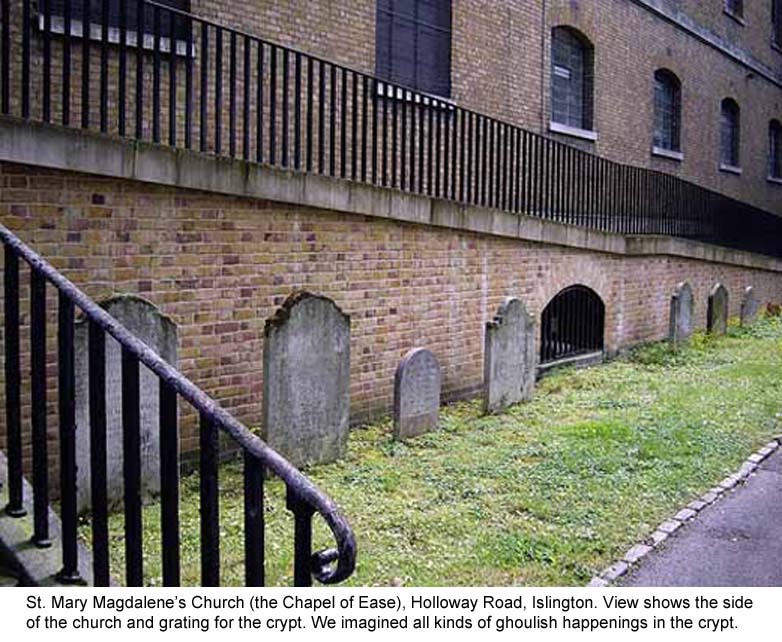 A fascinating place with tree covered pathways and crumbling tombs. I thought it would be just the sort of place she would like, and she did. I had previously visited the cemetery with my father on a trip to Waterlow Park. I would sometimes go with my mates to Clissold Park with a jam jar and long cane handled net to catch sticklebacks in the New River. The unfortunate victims of these fishing expeditions were kept in an old zinc bath in the backyard. I don’t recall if any of them survived for more than a couple of weeks. St. Mary Magdalene Church and gardens opposite the Central Library in Holloway Road was a popular place to play games like runouts. It also provided several large tombs to climb on. The vaults under the church had large barred windows at ground level, through which you could see the outlines of further tombs inside. Pamela always found this a fascinating place, as it took little imagination to think that this was likely a very haunted site. One of the games we played involved climbing the steps to the church, getting over the side railing and edging your way along the narrow ledge that ran around the building about two metres above the ground. If you could get as far as another set of steps without having to jump down if you lost your balance, that was regarded as pretty good. Sometimes during the long summer evenings, along with several of my friends we simply sat on the low wall of one of the houses up Crane Grove and just held a general discussion; about anything really that happened to catch our interest at the time. We would stay out until quite late as I can remember that the street light outside that particular house was often on. Few families had a television in those days and the only regular entertainment was listening to the radio or going to the Saturday morning matinée. Speaking of which, my mate, Alan Foster, lived with his family in one of the flats situated at the top floor of the old Highbury Picture Theatre Cinema at Highbury Corner, and on Saturdays his mother worked as an usherette. So, Alan his brothers, sister and friends were shown into the back of the stalls by his mum. As the cinema filled from the front to back, this evoked many curious glances from the kids in front, wondering who the VIPs were they could see being ushered into the back row. Barry Page and I occasionally went on weekend visits to the museums in South Kensington and sometimes trips to Hampstead Heath, or as often as not to no place in particular. I would usually take my sister’s scooter (I had actually assumed exclusive use of it at this point). When my sister visited recently, and I mentioned this to her, she in fact told me she had always thought it was my scooter. Barry would often use his roller skates, and we would present a considerable hazard to pedestrians as we both whizzed down Highgate Hill. I remember on one occasion nearly T-boning an ambulance as it emerged from St. Mary’s Hospital. My father was a keen bike rider and bought a bike for me. We did use it a few times, for example, trips to the Kingsland ‘Waste’, but in general I preferred to use the scooter as I could go where I wanted and did not have to breath in traffic fumes. With the scooter you could look in any shop window that you passed or take off through a park or gardens. It was cheap to get around either on buses, rail, trams or Underground, so if there was something interesting on - like the fair at the Vale of Health, Hampstead Heath, you could go and check it out. One might even be lucky enough to have sufficient money to spend on a ride or in sideshow alley. Kings Cross Station or Finsbury Park were also popular destinations to look at the trains. I liked seeing the steam engines, but I was never enthusiastic enough to be a train spotter. As I’ve mentioned previously, the ‘Waste’ in Kingsland Road was a place I sometimes went. The vast array of goods for sale on the stalls was always interesting. The Model Engineering Exhibition was something I always looked forward to, and I visited it on several occasions with my parents. Also the Motor Show at Earls Court, which I usually visited with my uncle John and my father. Another annual event on the family’s calendar was Tom Arnold’s Circus that was performing around Christmas time at Harringay Arena. It must have been 1950 when the lead pipes supplying the basin on the top floor landing froze one night creating a huge icicle that cascaded down the stairs. When it melted some days later. the moth-eaten carpet was obviously a write off, the stairs would dry out eventually, but some of the plaster on the stairs, from the basement to the first floor, fell off exposing the wooden laths. My father and uncle did a not very good job of re-plastering it. The semi-basement was always damp to one degree or another, particularly the passage beneath the exterior stairs that ascended on the side of the house. Here was the coal hole that would be filled by coal covered deliverymen in anticipation of winter. Coal fires were a feature of life back then, and I can remember reading books in the evenings and staring into the embers that always seemed full of fascinating glowing caves. The culmination of all this coal burning was, of course, the smog of 1952. Returning home from school was a novel experience during the smog. On my right was the ill-defined glow of light from the shop windows in Holloway Road, and on my left the vague glimpse of occasional headlights that slowly emerged from the darkness and gloom. I watched a bus pass with the conductor walking ahead carrying a useless torch. I guess he was checking the road for parked cars. Or maybe trying to find a bus stop. I seem to remember thinking I must be coming up to Digswell Street soon and then seeing the curb emerge from the smog about six feet in front of me. It was that bad. You had to move with caution as people didn’t have lights to warn of their approach.